Never been to a meditation centre or monastery before? ​Don't worry! You'll feel at home soon. We know that it can be a little intimidating to visit a monastery or meditation center for the first time. We will do everything we can to make you feel welcome and comfortable. We hope that this will help you get the most out of your time here. If you have questions about specific activities, check out the detailed descriptions. All of our public events take place off-site. You can always see the exact location on the calendar on our home page. ​Young people are welcome at all of our events. Parents can decide what will work best for their kids. We do have some special programs for children and youth. ​How do you greet them? 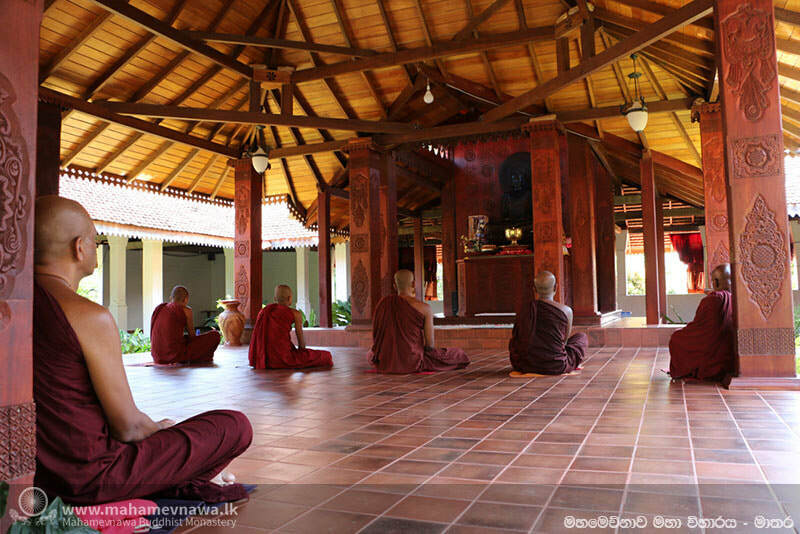 The monks are trained and ordained in the ancient Theravada Buddhist tradition. They wear robes and shave their heads. The only thing you really need to know about interacting with them is that they don't shake hands or hug. You can greet them with a smile or by placing your palms together in front of your chest. They are available after any of the activities to answer questions about Buddhism or meditation. Not at all. All of our activities are open to anyone free of charge with no need to even register. If you would like to get more involved, there are lots of opportunities. While you are here, you will see people bowing to the monks and to the Buddha statue. Bowing to people we respect is an ancient Buddhist practice all around the world. Don't feel any pressure to bow if you are not comfortable doing so. ​Some of our programs start with a chanting service. English programs will be chanted in English along with the ancient Buddhist language of Pali. We have lots of copies of the service you can read along with. You can also download a copy. It has explanations of everything we recite. Usually we will begin by offering flowers, candles, and sweet drinks in memory of the Buddha. Then we recite the qualities of the Buddha, Dhamma, and Sangha. We also usually will chant a short ancient scripture. ​After that we do a short guided meditation. If you have any questions about anything while you are at our activities, never hesitate to ask. If you have any questions now, just contact us at buddhameditationmd@gmail.com . We'll get back to you within 24 hours. Would like to visit monks? ​If you have questions or you want to talk about the meditation, call or email to schedule an appointment to visit us. Monks are available to talk with you.